I’m with the senior staff of Resurrection on a bus trip to visit Willow Creek and Granger. My phone has EVDO and will work as a modem. 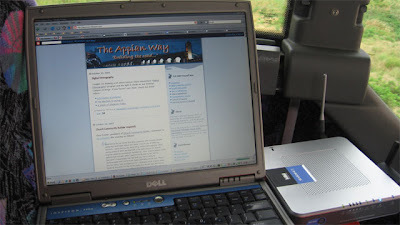 But being the geek that I am, I just had to give my fellow staff way for them to also have Internet access during the 9-hour bus rides there and back. 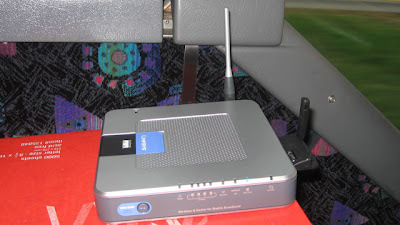 Fortunately, I have an EVDO-WiFi router I bought for my wife’s church a few months ago. The only thing I needed was a source of AC power. I called the bus company to inquire. 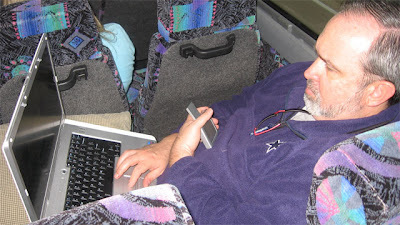 No, they didn’t have any outlets on the bus. Fortunately again, a few years ago I bought a 600 watt inverter that would do the trick. But then I worried about whether the driver would want to use the cigarette lighter outlet for his cell phone, GPS, or whatnot. Just to be safe, I bought a cigarette lighter Y adapter providing one socket for me and one for him! Guess what? It worked! Here’s my laptop browsing your favorite blog! 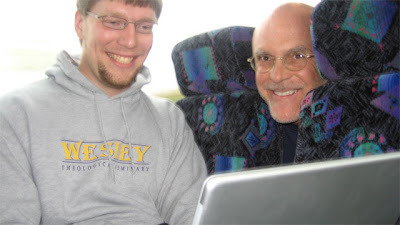 Here’s my boss, Brent (right) being goofy while Andrew Conard blogs using his Mac. I should also mention that Ian helped troubleshoot a problem this morning by connecting to Dave’s RDP session. It was Ian’s first help desk call to a moving bus! One problem, though. I found out that a WiFi router uses quite a bit of power. When I added one laptop to the 600 watt inverter it was okay. 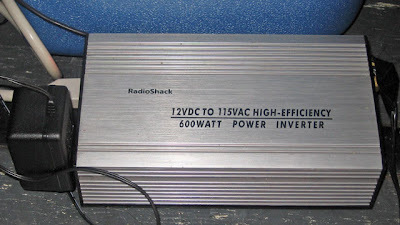 When I plugged in a second laptop, the inverter screamed at me and shut down the router. So we have enough power for the router and one laptop. Everyone else needs to run off of battery!